What Is an Osteophyte (Bone Spur)? An osteophyte is a smooth bony growth or deposit, also referred to as a bone spur. They grow slowly over time and often have no symptoms. They can cause pain if they impinge on other structures or grow so large as to restrict movement in a joint. They are also sometimes called osteochondral nodules, osteochondrophytes, and chondro-osteophytes. 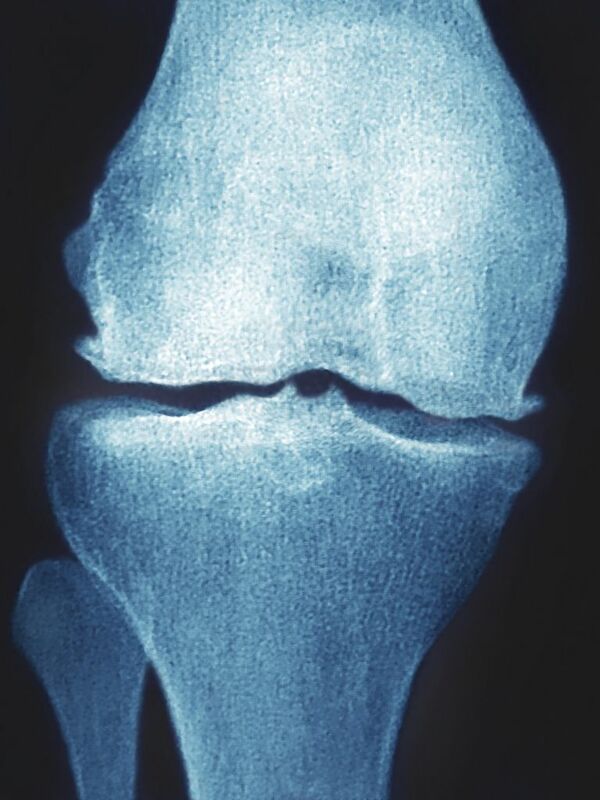 Osteophytes often develop in joints that show signs of degeneration. They are associated with the most common type of arthritis, osteoarthritis. Their presence can serve to distinguish osteoarthritis from other types of arthritis. While osteoarthritis involves degradation of cartilage, there is also remodeling of the subchondral bone in the joint, which can include forming bone spurs. Technically-speaking, an osteophyte is a fibrocartilage-capped bony outgrowth originating from precursor cells in the periosteum, the tissue that lines the bones and contains the cells that form new bone. Transforming growth factor β plays a role in their development. An osteophyte develops when the remaining cartilage in a damaged joint attempt a repair after there is cartilage loss elsewhere in the joint. It tends to form in the joint compartment where there has been cartilage loss, suggesting it is a localized event. Osteophyte formation stabilizes the damaged joint. That said, exactly how they form and what stimulates their formation is not completely understood. Osteophytes can also develop in the absence of explicit cartilage damage. Marginal osteophytes can develop at the periphery or margin of any joint. Central osteophytes are most prominent in the hip and knee. Osteophytes also may be found in the spine region, where they are associated with back or neck pain and considered a common sign of degenerative arthritis (osteoarthritis). In the spine, an osteophyte or bone spur can cause nerve impingement (compression of the spinal cord or nerve roots) at the neuroforamen (the empty space to the left and right of each vertebra which allows nerves to pass from the spinal cord to other parts of the body). Sensory symptoms in this situation include pain, numbness, burning and pins and needles in the extremity served by the affected spinal nerve root. Motor symptoms include muscle spasm, cramping, weakness, or loss of muscular control in an associated part of the body. The osteophyte itself is not painful, but its location and therefore its effect on other structures of the body can cause pain. Osteophyte formation in the hand can be diagnosed by a physical exam of the proximal interphalangeal joint (PIP), distal interphalangeal joint (DIP), and first carpometacarpal joint (CMC). Simply put, in the hand, a bump or lump may be visible during a physical examination. For other joints, the presence of an osteophyte can be diagnosed using imaging studies, such as X-rays or MRI or CT scan. If X-rays were performed on everyone over 50 years of age, most would show some evidence of osteophyte formation. Yet, most osteophytes don't produce any symptoms. Only around 40 percent of people with osteophytes develop symptoms that require treatment. Surgery: In the spine, removal of an osteophyte may be necessary for direct decompression of nerve impingement or to increase spinal canal width to reduce pinching by the osteophyte. Typically, conservative treatment is tried first. Surgery is reserved for people who have severe symptoms. Activity tends to increase pain associated with an osteophyte, while rest helps to lessen pain. Goel A. Is it necessary to resect osteophytes in degenerative spondylotic myelopathy? Journal of Craniovertebral Junction and Spine. 2013 January-June;4(1):1-2. Bone Spurs (Osteophytes). Cedars-Sinai. https://www.cedars-sinai.org/health-library/diseases-and-conditions/b/bone-spurs.html. Neuroforamen - An Overview. Laser Spine Institute. https://www.laserspineinstitute.com/back_problems/spinal_anatomy/vertebral_column/neuroforamen/. Wong SHJ, Chiu KY, Yan CH. Review Article: Osteophytes. Journal of Orthopaedic Surgery. 2016;24(3):403-410. doi:10.1177/1602400327. Could You Have a Bone Spur and Not Know It? What Does Joint Space Narrowing Reveal? Do You Know What Could Be Causing Your Knee Pain? Calcium pyrophosphate crystals in cartilage cause this painful condition. What Does It Mean If You Have Tricompartmental Osteoarthritis? What Are the Risk Factors for Generalized Osteoarthritis?